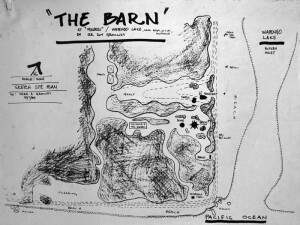 Drawing by Marr of the Penders site with Barn. In November 1985, in the the pages of Architecture Australia, Jennifer Taylor admitted Roy and Betty Grounds’s Barn at Penders into the pantheon of Australia’s finest buildings. Today this unusual little structure still has the power to enthrall. 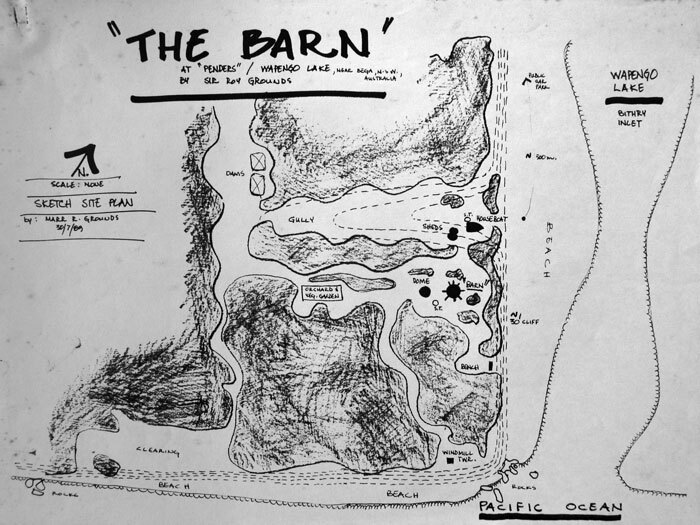 Located at Bithry Inlet on the southern NSW coast, the Barn was Grounds’s “bolthole” for 15 years, his holiday escape whilst designing the National Gallery of Victoria and the Victorian Arts Centre. The site and its structures are now part of Mimosa Rocks National Park, itself a monument to the vision of Grounds and his friend, Melbourne businessman Kenneth Myer. In 1981, they gave their 220 hectare property to the nation, conserving a remarkable piece of coastline as a national park. As originally built in 1965, the Barn was a large tepee of spotted gum poles, with a tapering roof-vault lined horizontally with Tanalith-treated saplings that had been carefully graded in decreasing size from bottom to top. On the roof were sods of kykuyu grass complete with a sprinkler system. In spring, the roof was completely covered in yellow daisies. However, the roof’s weight soon threatened to crush the supporting structure. Its rustic charm was replaced by a roof of bright yellow semi-translucent corrugated fibreglass. Grounds loved the startling transformation – the Barn now stood out like a bright yellow beacon. The original roll-down nylon sailcloth blinds, also yellow, hung vertically from the roof’s lower edge. Inside, the effect was of permanent sunshine. Light, the seasons, cross ventilation to deter sandflies, and the effects of the sun could all be controlled by simply raising and lowering the blinds.